The ancient Druids studied the movements of the Cosmos for millenium before the construction of Stonehenge. The earliest potholes date back to 8000 BC. The designs were laid out to measure the passage of the Sun. 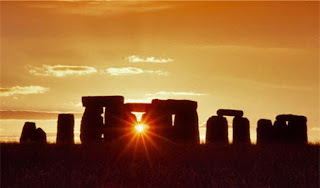 Two days ago the sun shone between the two autumn stones as it had thousands of times marking the equinox.. The new season has begun. The season of changing colors. This entry was written by Peter, posted on September 21, 2018 at 2:25 pm, filed under Nature and tagged druids, equinox, stonehenge. Bookmark the permalink. Follow any comments here with the RSS feed for this post. Post a comment or leave a trackback: Trackback URL.